Generic Cabergoline tablets (Caberdost) are a dopaminergic medication which is used to treat high levels of prolactin hormone. High levels of prolactin in women can cause symptoms such as unwanted breast milk and missed periods and can cause difficulty becoming pregnant. High levels of prolactin in men can cause symptoms such as enlarged breasts and decreased sexual ability/desire. Generic Cabergoline tablets (Caberdost) are used for the treatment of hyperprolactinemic disorders, including prevention of production of milk in women after birth, if breast-feeding is to be prevented for medical reasons. Caberdost tablets are also recommended as treatment in Parkinson's disease. Generic Cabergoline tablets are also used by bodybuilders in professional bodybuilding and weight-training athletes during anabolic steroid cycles to increase muscle mass. Caberdost tablets are also used by bodybuilders to decrease the side effects such as gynecomastia that develop due to the administration of anabolic steroids. In our online pharmacy, Caberdost tablets are available in the strength of 0.5 mg of Cabergoline. Caberdost tablets are manufactured by HAB Pharmaceuticals & Research Ltd. (Signature) in the strengths of 0.5 mg. We also have in stock Fertomid tablets (Generic Clomid) which is used for the treatment of ovulatory dysfunction in women who wish to become pregnant. 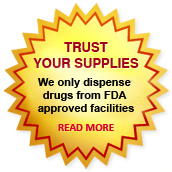 We supply original Caberdost tablets manufactured by HAB Pharmaceuticals & Research Ltd. (Signature). Other brand names for Cabergoline tablets include Dostinex, Actualene, Agalates, Cabaser, Cabaseril, Cabergolek, Cabergolin, Cabergolina, Cabergolinum, Caberpar, Cabeser, Cabest, Cieldom, Galastop, Kabergolin, Lac stop, Lactamax, Lactovet, Prolastat, Sogilen, Sostilar, Triaspar. The active pharmaceutical ingredient in Caberdost tablets is Cabergoline. Each Caberdost tablet contains 0.5 mg of Cabergoline. The inactive ingredients present in Caberdost pills are leucine, USP, and lactose, NF. 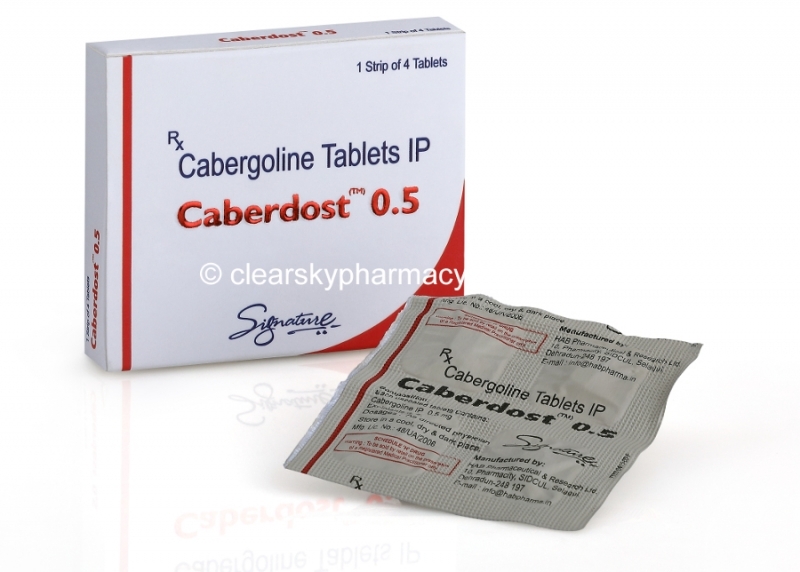 Caberdost 0.5 mg tablets, manufactured by HAB Pharmaceuticals & Research Ltd. (Signature), contain Cabergoline which is a dopaminergic medication. Caberdost tablets are typically administered as oral therapy to reduce the blood level of prolactin hormone in patients who are diagnosed with abnormally elevated levels of prolactin, a medical condition termed as hyperprolactinemia. Caberdost tablets are used for treating the symptoms of hyperprolactinemia such as production of excess breast milk after childbirth, missed periods, difficulty in conceiving, reduced fertility, and bone loss. In men, high prolactin levels result in symptoms such as enlarged breast tissue and decreased sexual ability/desire. Generic Cabergoline tablets produce their medical effect by inhibiting the secretion of prolactin hormone from the pituitary gland. Caberdost tablets are used to prevent the synthesis of breast milk after childbirth, if breast-feeding is to be prevented for medical reasons. It is also administered after stillbirth or abortion. Treatment with Generic Cabergoline (Caberdost tablets) is usually recommended in patients diagnosed with Parkinson's disease, a mental disorder in which there is a decrease in the transmission of the dopamine neurotransmitter in the brain resulting in symptoms such as body stiffness, shaking (tremor), reduced muscle control, imbalance, and sluggish body movement. Generic Dostinex tablets effectively increase the dopamine transmission in the brain thus treating the symptoms of Parkinson's disease. Bodybuilders use Caberdost tablets (Cabergoline tablets) along with other supplements in the dietary regime inorder to gain increased muscle mass and weight loss by getting rid of excess body fat. Using Caberdost tablets, weight training professionals and bodybuilders can decrease the development of gynecomastia (breast enlargement) that arises as a side effect of anabolic steroids such as Nandrolones and Trenbolones. For inhibition of lactation Cabergoline tablets should be administered during the first day post-partum. The recommended therapeutic dose is 1 mg (two 0.5 mg tablets) given as a single dose. For suppression of established lactation the recommended therapeutic dosage regimen is 0.25 mg (one-half 0.5 mg tablet) every 12 hours for two days (1 mg total dose). This dosage regimen has been demonstrated to be better tolerated than the single dose regimen in women electing to suppress lactation having a lower incidence of side effects, in particular of hypotensive symptoms. The recommended initial dosage of Caberdost tablets (Generic Cabergoline) is 0.5 mg per week given in one or two (one-half of one 0.5 mg tablet) doses (e.g. on Monday and Thursday) per week. The weekly dose should be increased gradually, preferably by adding 0.5 mg per week at monthly intervals until an optimal therapeutic response is achieved. The therapeutic dosage is usually 1 mg per week and ranges from 0.25 mg to 2 mg per week. Doses of cabergoline up to 4.5 mg per week have been used in hyperprolactinaemic patients. The maximum dose should not exceed 3 mg per day. Caberdost Tablets - Missed Dose. In case you miss your regular dose of Caberdost tablets (Generic Cabergoline tablets), take it as soon as you remember. You can continue your regular schedule the next day. If you remember the missed Caberdost tablets the next day, take your regular dose and skip the missed dose. Do not take a double dose to compensate the missed dose of Caberdost tablets. Generic Cabergoline tablets have to be stored at room temperature (15°C to 30°C) away from moisture and sunlight. Do not store above 30°C. Keep them in the original package. Protect from light. History of cardiac valvular disorders, as suggested by anatomical evidence of valvulopathy of any valve, determined by pre-treatment evaluation including echocardiographic demonstration of valve leaflet thickening, valve restriction, or mixed valve restriction-stenosis. History of pulmonary, pericardial, or retroperitoneal fibrotic disorders. Dopamine agonists like Generic Cabergoline Tablets in general should not be used in patients with pregnancy-induced hypertension, for example, preeclampsia, eclampsia, and post partum hypertension, unless the potential benefit is judged to outweigh the possible risk. All patients should undergo a cardiovascular evaluation, including echocardiogram to assess the potential presence of valvular disease. If valvular disease is detected, the patient should not be treated with Generic Cabergoline tablets. Generic Cabergoline should be discontinued if an echocardiogram reveals new valvular regurgitation, valvular restriction or valve leaflet thickening. Generic Cabergoline should be used with caution in patients exposed to other medications associated with valvulopathy. Postmarketing cases of pleural, pericardial, and retroperitoneal fibrosis have been reported following administration of DOSTINEX. Some reports were in patients previously treated with other ergotinic dopamine agonists. Generic Cabergoline (Caberdost tablets) should not be used in patients with a history of cardiac or extracardiac fibrotic disorders. Avoid or restrict alcohol consumption during the course of Cabergoline tablets. Cabergoline tablets may make you light-headed or impair your vision. Avoid activities such as driving, using machinery, or performing any activity that requires complete vigilance or perfect vision until you are sure about your safety. If you plan to have surgery or any dental procedure, inform your doctor, anesthetist, or dentist about your course of Caberdost tablets (Generic Dostinex tablets). In case of an emergency medical treatment, please inform the practitioner about your course of Caberdost tablets and the details of your last dose. Generic Cabergoline Overdosage can be expected to produce nasal congestion, syncope, or hallucinations. Measures to support blood pressure must be taken if necessary. Cardiovascular System: - low blood pressure, abnormal heart rhythm changes, chest pain. Central Nervous System: - nausea, headache, dizziness, vertigo, mental/mood changes, insomnia, hallucinations, behavioral changes, depression, fainting, abnormal or unusual thoughts. Eye and ENT: - nosebleeds, persistent cough, vision changes. Gastrointestinal System: - constipation, stomach pain, indigestion. Genitourinary System: - breast pain, painful menses, changes in the amount of urine. Musculoskeletal System: - swelling in ankles/feet/hands, lower back/flank pain, uncontrollable muscle movements. Hypersensitivity: - rash, itching/swelling (especially of the face/tongue/throat), severe dizziness, trouble breathing. General: - weakness, unusual tiredness, loss of appetite, hot flashes, hair loss. Inform your doctor immediately if you experience any of these side effects. This is not a comprehensive list of all the possible side effects of Caberdost (Generic Dostinex tablets). If you develop any other medical conditions during the course of treatment with Cabergoline tablets, please consult your doctor immediately. Cabergoline has been classified by the US FDA as Category B. There were maternotoxic effects but no teratogenic effects in mice given cabergoline at doses up to 8 mg/kg/day (approximately 55 times the maximum recommended human dose) during the period of organogenesis.At daily doses of 0.5 mg/kg/day (approximately 19 times the maximum recommended human dose) during the period of organogenesis in the rabbit, Cabergoline caused maternotoxicity characterized by a loss of body weight and decreased food consumption. There are, however, no adequate and well-controlled studies in pregnant women. Due to the fact that animal reproduction studies are not always predictive of human response, this medicine should be used during pregnancy only if clearly needed. Do not use this medicine without your doctor's consent in case you are pregnant. Stop using this medication and inform your doctor immediately if you become pregnant during treatment. It is not known whether this medication is excreted in human milk. Since many medicines are excreted in human milk and because of the potential for serious adverse reactions in nursing infants from Cabergoline, a decision must be made whether to discontinue nursing or to discontinue the drug, taking into account the importance of the drug to the mother. You can buy Generic Cabergoline 0.5 mg Tablets online from Clear Sky Pharmacy. Caberdost 0.5 mg pills are supplied in a box of 4 tablets. The price of 0.5 mg pills is only $2.35 each when you place an order for 200 pills.